For nearly 100 years, Minnesota made Federal ammunition has been a popular choice among discerning hunters and target shooters. 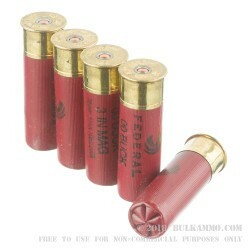 The Federal Power-Shok brand shotshell utilizes their triple plus wad system and a granulated plastic buffer. This allows for better patterns at distance due to better shot alignment and less deformation of pellets after firing. This design increases long-range performance and accuracy, whether it be during your next hog or deer hunt, or in a home defense situation. 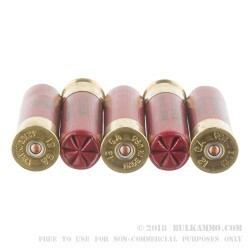 This hard-hitting Federal Power-Shok 12-gauge Magnum comes with 15 pellets of 00 buckshot loaded into a 3” shotshell and provide a reliable, high-quality round at a bargain price. 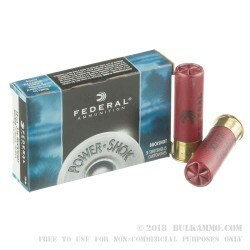 Five rounds of Federal Power-Shok 12-gauge ammunition come in each box. Famous for their Federal Premium brand of ammunition, Federal continues to be on the cutting edge of ammunition technology and produces some of the most dependable ammunition available out of their Anoka, Minnesota manufacturing facility.